There are so many different factors that can go into making the decision on what type of roof is going to work best for your home. With all of the different options out there, you are sure to find something that you like aesthetically, as well as financially. Here’s research to make sure that you have made the best decision. A large chunk of this important decision may be based on where your home is located in the US. Different locations offer different standards of style, which may influence what you choose as your best roofing option. Additionally, the local weather may be a large factor. Weather can have a big impact on your roofing material because some materials stand up to harsh weather better than others. Roofing tiles are popular in a number of different communities across the United States. There is something distinctly southwestern about roof tiles, and you will see a lot of them in the warmer and dryer southern and mid-western states. 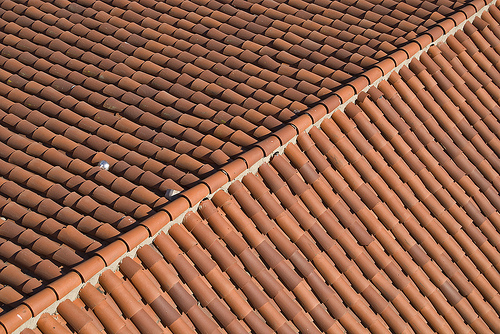 Spanish & clay tiles offer a type of diversity that other types of roofing materials can’t match. These tiles are available in a variety of profiles that can suit any architectural style to fit in with your home and neighborhood. Tiles are known for their flexibility, individuality, and numerous options. The pros and cons of choosing terra cotta and polymer slate as a roofing option for your home are outlined below, to help aid in your decision. There are many different factors that will contribute to the final decision of whether tile roofing is right for your home. For many the style and distinctiveness of the tiles outweighs the negatives. They provide thermal insulation. Roof tiles can keep you comfortable within your home all year, and this can help you to save money on your energy bills by reducing your home heating and cooling costs. Tiles do not corrode, warp, or rust, which are frequent problems with other types of roofing materials. Tiles are impervious to ice and frost. They are ideal for homes found in colder climates due to this durability, and they will never warp or crack regardless of how cold the weather gets. They are tank water safe. Roof tiles are created from clays that are naturally occurring, and this means that any water that runs off of your roof into a rainwater tank is both safe and clean. Roof tiles are salt safe. These tiles are ideal for roofs on homes in costal locations because they can withstand the spray, wind, and salt that are associated with living near the ocean. They will not corrode over time despite this harsh environmental impact. Their color never fades. The color associated with roof tiles is long-lasting and won’t fade despite harsh weather conditions and the sun beating down on them. This can save you the cost of tile replacement due to fading. They provide for acoustic insulation. Roof tiles help in keeping any unwanted noise out of your home. Roof tiles have advanced properties in insulation that keep potentially annoying noises from being heard. Terra Cotta means ‘baked earth’ in Italian. Terra cotta is a type of clay or ceramic material that has been baked in an oven, thus the name. These tiles can come in either a glazed or unglazed form. Terra cotta is typically an earth tone color of orange-brown. Tile systems made from terra cotta have been around for centuries and are known to be long lasting. They can also improve the look of your home and its overall value. In aesthetic terms, not every home will look better with these clay roofing tiles. Many structures with terra cotta roofs were originally designed with them in mind. Cooler inside temperatures. Because of the lighter color of the material, terra cotta tiles reflect the sunlight much better than darker colors. They are also relatively porous as opposed to slate, so they release the heat faster. This is why you’ll find terra cotta tiles on many homes in the warmer climates of the Southwestern U.S. Durable and long lasting. Terra cotta tiles are durable. Even the baddest squirrel on the block won’t bother chewing through one of these tiles. They are resistant to insects and rot, and they are also fireproof. Another added benefit to terra cotta tiles is their shape. The tiles are curved into a half barrel shape that allows rainwater to roll right off. There are fewer places for water to pool on your roof which means a longer lasting and lower maintenance roof all around. Terra cotta’s biggest enemies are probably tree branches, hail or any other blown or fallen object that can crack or break the tiles. While these situations are rare, they can occur, and replacement tiles will be needed. Good for the environment. Terra cotta tiles are made from clay, one of the Earth’s natural resources. It’s an age-old way to construct building materials, and the tiles can withstand the elements better than most other common roofing materials. Natural slate is beautiful. It’s made from mined slate that is formed into shingles. It is fireproof and waterproof. Natural slate roof tiles are not inexpensive–you’ll see them on only the very finest homes. The drawback to natural slate roof tile is that it’s brittle. Some slate roof tiles are soft and tend to crumble with time. It can be damaged by hailstorms, airborne storm debris, or even workers who are on the roof to repair it. Synthetic slate tiles look natural and are available in a wide range of colors. The tiles look just like natural slate roof tiles, but they cost half as much. They’re also resistant to freezing and thawing, and have a Class A fire rating. They’re wind resistant up to 110 miles per hour, and are Class 4 impact resistant. Slate polymer tiles add beauty and value to your home. If you’re interested in installation on your home, call Texas Star Roofing. We’ll show you the available color, and show you a sample tile.